My computer wont turn on or computer not turning on is a common problem that can happen with anybody anytime. It can happen to your desktop where your PC wont turn on or your laptop or notebook. This problem where your computer wont turn on can be caused due to various reasons that I am going to discuss here and also provide the solutions for fixing it. First I will list down the various causes and fix for PC wont turn ON problem and then I will do the same for Laptop wont turn ON problem. Let’s get started and solve issues regarding computer not turning on or computer will not turn on. Here are the various causes and their fix if your desktop PC wont start or your PC wont boot. 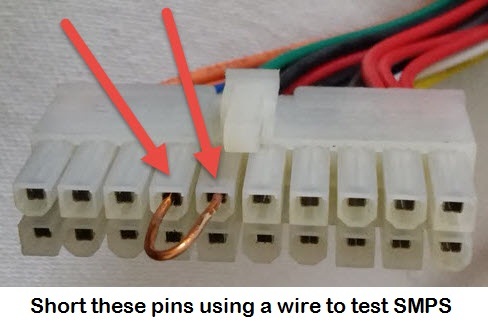 If your computer is not getting power then the the first thing you should do is to check your computer power cable that goes into your SMPS or PSU. It might be possible that the power cable has been damaged internally. You can test the power cable using a Multimeter by connectivity check feature or a simple line tester. 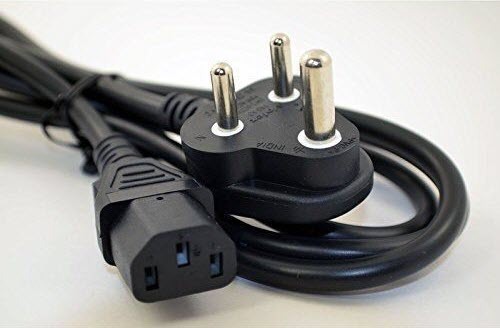 You can use a different power cable to see if your PC is powering ON or not. If it is getting the power and starting up as normal then you have the faulty power cable and if it is still not getting power then you can move to the next step mentioned below. The next thing to do when your computer wont turn on is to check whether the power button of your cabinet is working or not. 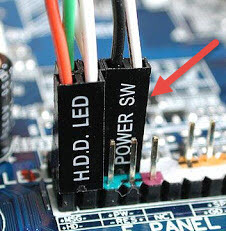 You can check this by shortening the power pins on the motherboard with a screw driver. Take a normal screw driver, locate the two power pins on your motherboard and then touch both of them with your screw driver for a second or two. If your computer powers ON and boot normally then the issue is with your pc cabinet power button and if it does not then you can go through the next step mentioned below. Also make sure that the power pin connector of your power button is fitted properly and tightly on your motherboard power pins. It might be possible that your SMPS or power supply has gone faulty. If the SMPS is damaged then your PC wont start. To test the SMPS short the indicated SMPS pins of 20+4 motherboard / ATX connector and turn On the power to see if the SMPS starts or not. If the SMPS fan does not start or the SMPS is not powered ON then it is damaged. Here the only fix is to replace your SMPS with a newer one. If the SMPS starts and its fan is spinning then you follow the next step given below. Important Tip: Always use a good quality Spike Guard or Spike Buster Power Strip for your computer to protect it from voltage or current spikes. It might be possible that something is getting short in your cables or motherboard. Here remove all the cable except the main power cable (24-pin) of your motherboard and start your PC. It the SMPS starts and the POST screen is displayed then you might be having some faulty cables. Inspect all the cables one by one and replace the faulty one. A faulty motherboard can also be a cause of this problem where your pc wont start at all. If the SMPS and all the cables are OK then it might be possible that your motherboard has gone damaged somehow. Here the best option would be to take it to the service center and get it inspected, repaired or replaced. In some motherboards it can happen that a discharged or loosely fitted CMOS battery won’t allow your PC to start. So make sure that your BIOS or CMOS battery is working fine and is properly fitted in the motherboard. Make sure that the voltage you are getting in your home or office is proper. This is because low voltage can also prevent your computer from powering ON. You can test the voltage in your home by using a digital multimeter. If your computer is getting power and all fans are spinning but your PC wont boot then it can be an issue with RAM. Test whether your RAM is working fine and if it is then just put it again in its slot properly. Before inserting RAM in the motherboard slot just clean the slot and remove any dust from it. If your PC is powering on but fails to boot then it can be possible that your Hard disk is damaged or the SATA connectors or power connectors are loose. So here test the hard disk and make sure that all the connectors are fitted properly and are tight. If your computer fails POST (power on self test) or has irregular POST then your computer may generate one or more beeps. Different BIOS have different beep codes for indicating the problem with your hardware. You can identify the problem with your computer or component by identifying the beep codes. Below is the link to various beep codes with their meanings or descriptions. If all your hardware devices are fine and your computer has normal POST but after it won’t load the OS then it means that it is an issue with your operating system. The operating system boot files might have gone corrupt and to solve this you have to use the OS bootable CD/DVD to repair the boot files. Here are the various problems and their fix if your laptop wont start or laptop wont boot. Turn Off the Laptop and remove the power adapter or charger. Press the Laptop Power button for 30 to 60 seconds. Wait for a 5 minutes. Insert the Laptop battery in its place. Note: For performing above power cycle steps your laptop battery should be charged. If you are starting laptop from the battery and the adapter is not attached then it might be possible that your battery is completely discharged or is not getting charged. If the battery is not getting charged then you should replace it with a new battery. Check whether your laptop power adapter is working properly and providing the appropriate voltage. You can check this with the help of a digital multimeter. It might be possible that your laptop’s motherboard has gone faulty and for this the only option would be to take your laptop to the authorized service center and get it checked. I have already explained this in the PC wont start issues mentioned above. If you are still facing issues where your computer wont turn on or your computer wont boot then you can ask me by leaving a comment below clearly stating your problem along with your computer and hardware components details. I have pc with intel core2duo, g41wv motherboard,2 gb ram, after changing tharmal paste my pc is not starting it making beep beep sound constantly, green light is on but redlight is dim or is it off I dont know, what is the prblm,i hav touched hd it seem like spining and suggest me solution pls. Recenly I hav used pcb cleaner spirit for cleaning old tharmal paste and some dust on Mboard it beacase of that it happening. Remove and insert the RAM again couple of time. Also check all the connections. Also which BIOS you have? If you have graphics card then remove it and plug it again. Also try to start the PC without graphics card. कैबिनेट को खोल कर देखा तो सब कुछ सही लगा हुआ था. पॉवर सप्लाई का फैन एक बार स्टार्ट हुआ और बंद हो गया, सी पी यू के फैन में भी केवल एक बार हरक़त हुयी और वो भी बंद हो गया. पॉवर बटन ON करने पर पॉवर सप्लाई का फैन केवल इतना ही चलता है जैसे किसी ने हाथ से एक बात चल दिया गया हो. पॉवर सप्लाई को आपने ऊपर बताये अनुसार मैंने चेक कर लिया है वो ठीक है.